Five years ago, the Australian harpsichordist Jacqueline Ogeil recorded a splendid Dietrich (more accurately, Dideric) Buxtehude keyboard recital (Move). Now, with her new Melbourne-based ensemble, Arcadia, she turns her attention to the magnificent cantatas of this "world-renowned ... incomparable musician and composer" (as his funeral poem described him). Only about a third of Buxtehude's 128 extant cantatas have appeared on record, unlike his smaller but better known organ oeuvre. One reason, as John O'Donnell's booklet notes explain, is that they still await a complete modern edition. Such neglect is certainly undeserved. The eight recorded here exemplify the breadth of Buxtehude's poetic imagination, depth of religious devotion, exuberant virtuosity and sensuality, and his perfect synthesis of multiple styles: modern and retrospective, Italian, Hanseatic, Dutch and even English. No wonder Buxtehude's contemporaries, including the young Bach, so admired his music. From the organ, Jacqueline Ogeil directs the ensemble's two sopranos, bass, three violins and gamba with assurance. Only a marginal lack of exuberance prevents these beautiful, sensitive performances from meriting 5 stars. The bass, Michael Leighton Jones, is the star. His agile, perfectly controlled, expressive voice is perfect for Buxtehude's smoothly rhythmic yet flamboyant and virtuosic style. His solo performance of one of my favourite cantatas, Mein Herz ist bereit (BuxWV 73), is masterful, even if I would welcome more ornamentation. The two sopranos, Margaret Pearce and Helen Gagliano are slightly less confident. But, while they do not equal Emma Kirkby or Susanne Rydén, they are poised musicians attuned to the stylistic demands of Buxtehude's often florid writing. The sparkling violin-playing is also very attractive. 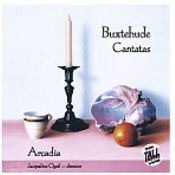 As the program notes to both of these recordings point out, the term "cantata" was not yet applied in Buxtehude's day to sacred vocal works in the Lutheran Church. Works like those recorded here would have been called motets, concertos, or arias. Inevitably, we think of JS Bach's church cantatas as the epitome of the genre, but these works by Buxtehude are very different in scope and format. Indeed, they differ considerably from one another. As the heading indicates, several of them have Latin texts. The words, whether Latin or German, are drawn from scripture (especially the Psalms), devotional poetry, chorale verses, or a combination of these. Where a Bach church cantata typically has at least outer movements with genuine orchestral accompaniments, the works here are all chamber music. None has more than three voice parts, and the one with the greatest number of obbligato instruments is Mein Herz ist Bereit with three violins and continuo. Many follow the format of the Italian chamber cantata, with what can be better described as a succession of contrasting sections than freestanding movements. The Elegy (Kiaglied) on the Limoges Ensemble disc is a strophic composition with seven stanzas; three are sung here, though all seven are printed in the booklet. In Dulci Jubilo on the Arcadia release is an elaboration of the familiar Christmas chorale for three voices (sopranos and a bass), two violins, and continuo. The performances on both of these discs are of a level we have come to expect from the finest early music ensembles. Christophe Coin is an outstanding virtuoso on the viola da gamba. The Limoges Baroque Ensemble was founded in 1984, and Coin became its director in 1991. Their performances here are extraordinarily incisive and energetic. They give the impression that this music is the most natural thing in the world for them. The motet Jubilate Domino is a bravura showpiece for a solo singer, probably written for an Italian castrato who visited Lubeck around Easter of 1672. Tenor Rodrigo del Pozo sings it with great fluency and purity of tone. He almost makes it sound easy. The vocal works sung by soprano Benedicte Tauran may be less florid, but they do require considerable artistry and control. Tauran is especially impressive in the long-breathed melody of the Elegy. This disc also contains instrumental music. Coin and violinist Gilles Colliard are the principals in two sonatas for violin, gamba, and continuo. Jan Willem Jansen plays the Prelude in G for harpsichord and two pieces for organ: the preludes on the 'Song of Simeon' (Mit Fried' und Freud' Ich Fahr Dahin) and Toccata in D minor. The organ works are played on the 1981 Jurgen Ahrend organ, built in the North German style, at the Augustinian Church at Toulouse. The unequal temperament of the organ and harpsichord may rub some listeners the wrong way. The notes to the Tall Poppies disc give no information about the Australian ensemble Arcadia, except to list the members and their director, Jacqueline Ogeil, who directs from the organ. The distributor's website adds that this is a new ensemble formed in Melbourne especially to perform rare baroque vocal works. The performances are very good, but I have some reservations about the recording's acoustical effect. It was made in the Carmelite chapel at Kew, Melbourne. Rather than have the voices stand out prominently, the object here is "to present voices and instruments as a single ensemble, each member of equal importance". This is supposed to simulate the effect of performing the works from the rear gallery of a church, as would have been done in Buxtehude's day. In that setting the singers would most likely have stood at the front of the gallery with the instrumentalists seated farther back behind the gallery rail, grouped around the organ. That would give the voices a natural prominence when heard from the floor below. (Compare a recording of Bach's Easter Oratorio and Magnificat in D, directed by Paul McCreesh and sung from the gallery of an 18th Century German church: DG Archly 469 531, July/Aug 2001.) Here, however, the ensemble sounds somewhat far away, enveloped in reverberation, so that texts do not come across clearly. While the singers are not swamped by the accompaniment, it would be better if the voices were slightly more prominent. Bass Michael Leighton Jones gets the worst of it, since the bass voice does not naturally cut through an accompaniment as well as the two sopranos, Helen Gagliano and Margaret Pearce. No one should be deterred on that account. Anyone serious about Buxtehude will want to acquire this.